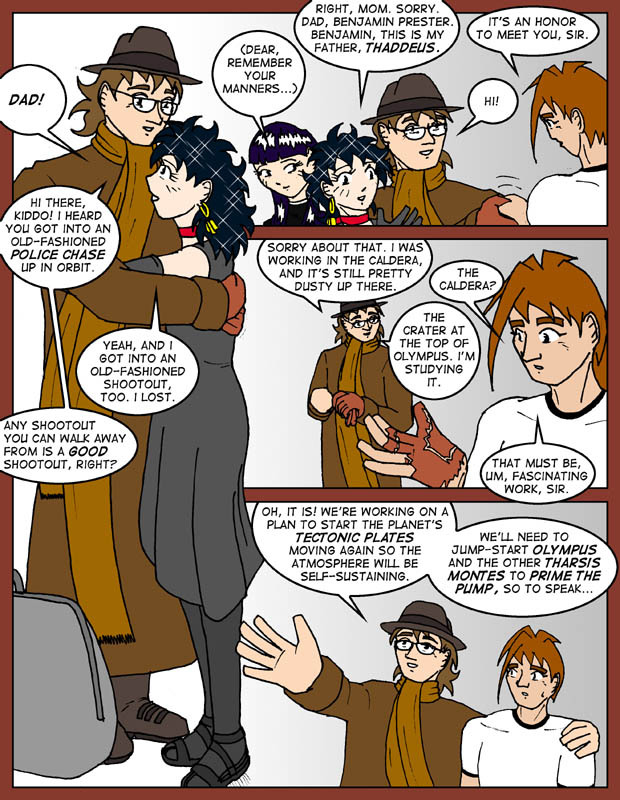 Yes, the mysterious stranger is Caprice's father! Who else would have made a "dad joke"? The science in this page might sound like gibberish, but it's real. Active plate tectonics - the creation and subduction of the great plates of rock that float on the mantle - are important to maintaining a living atmosphere. For example, the carbon cycle (the movement of carbon from air to water to stone and back again) is intimately related to plate tectonics. Smaller planets like Mars cool more quickly than larger ones like Earth. The decay of radioisotopes and the residual heat from the smaller planet's formation aren't enough to provide a source of convection and hot magma to keep the smaller planet from forming a thick crust that stops moving. When the tectonic plates stop moving, as planetologists believe is the case with Mars, and the volcanoes stop erupting, gases in the atmosphere quickly bind with whatever rocks they can. The atmosphere effectively dies. Restarting the tectonic plates, and the volcanoes, would allow the Martian atmosphere to replenish itself like the atmosphere of Earth does. This is a very long-term problem to deal with - it's only an issue over the course of millions of years - so the Martians are being very forward-thinking. The Tharsis Montes to which Thaddeus refers are the volcanoes to the southeast of Olympus Mons. Olympus is sometimes considered to be one of them. If you were wondering why Caprice is the way she is you can pretty much stop wondering now. I think Jon deserves a round of applause for creating the characters of Wei, Xia, and Thaddeus Quevillion -- they're engaging and well-defined and a heck of a lot of fun to draw. So bravo, I say! Bravo!